A group of men gathering around a sacrificed animal to see how it falls, an indication of the auspiciousness of the sacrifice. The sacrifice has been made near the beer vessels arranged near a colwic shrine, erected for the spirit of a girl called Nyakewa killed by lightning. This event was witnessed by Evans-Pritchard in 1936. The colwic shrine, consisting of an mound of earth surrounded by offerings of tobacco with a sapling of the nyuot tree planted in the centre can be seen in other images. Nyakewa was considered to have become a colwic, a spirit taken directly by God. This specific intervention by the divine was considered so dangerous to all associated with the deceased that sacrifice is made by all relatives. In all more than twenty animals were sacrificed over several days. Note on print reverse ms pencil - "02 2 Col wic" & print front border ms ink - "NUER XI/78"
Morton, Chris. 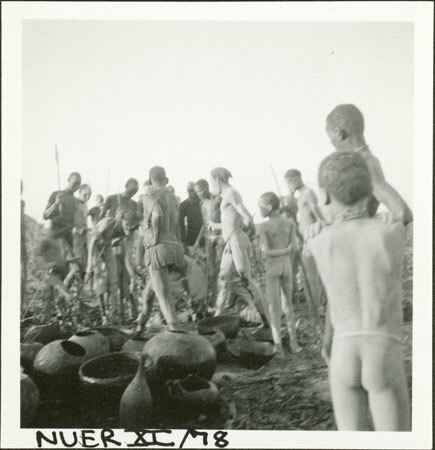 "Nuer colwic ceremony" Southern Sudan Project (in development). 03 Jan. 2006. Pitt Rivers Museum. <http://southernsudan.prm.ox.ac.uk/details/1998.355.536.2/>.